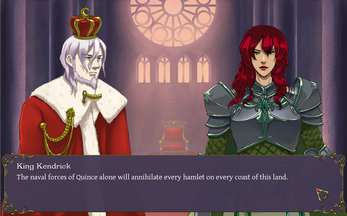 Queen at Arms is a fantasy visual novel from Aqualuft Games. 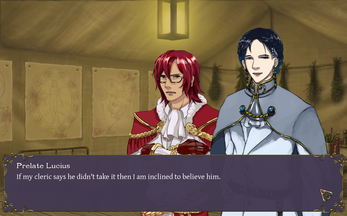 As a young girl, Marcus Cordale was rescued from a violent political coup and taken away from the country of her birth. To protect her identity, she was raised as a boy. When she comes of age, she joins the army of Orthera, in search of her elder brother. But when war breaks out, the Ortheran army is thrown into turmoil, and the young recruit is catapulted through the ranks. Can she step up to lead, and wage a battle against the kingdom she called home? Every choice counts: Player agency is everything, and you can act as you please. But be aware—each time you make a decision, it has the potential to affect everything from battle outcomes to your relationships with other characters. And you may lose a friend or two before the war is over! 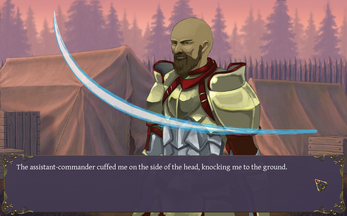 Prepare for battle: Before major battle sequences, the player has the opportunity to hone many different skills, including swordplay, medicine, and magic. What you take the time to learn can make all the difference in a future skirmish! Relationships with others: The player's relationships with NPCs are more than just dry statistics—each character has a story to tell and secrets to uncover. Acting in a certain way towards one person may jeopardize or strengthen your relationship with another. 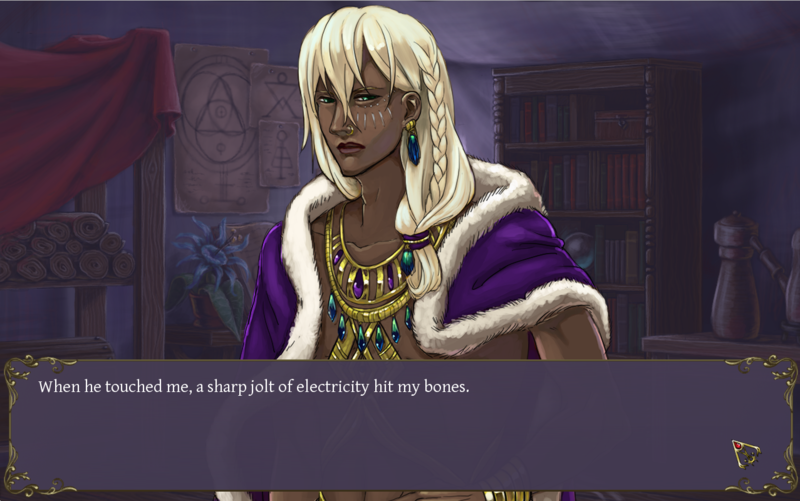 Complex themes: The story tackles matters of gender identity and diverse sexualities, and features the potential for relationships with characters both male and female, in a culture where standing out can at times be dangerous. 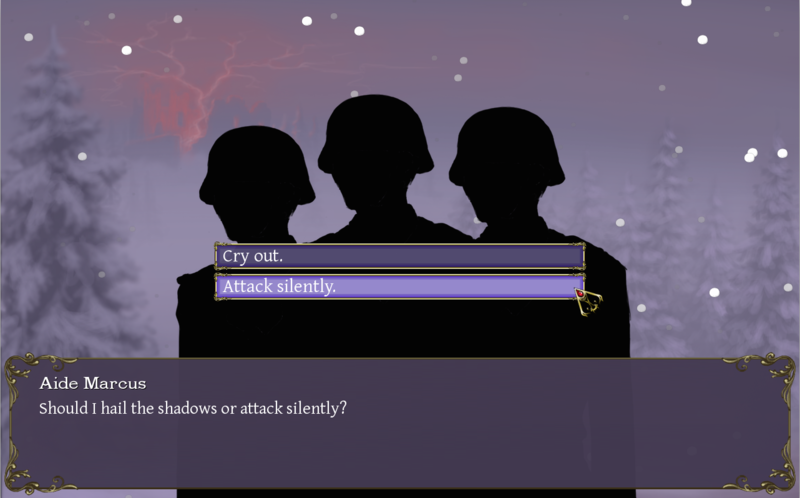 A visual novel is very much like a choose-your-own-adventure book, presented as a multimedia experience. Make tough decisions in order to advance the plot and stay alive, and watch the story unfold with all original art and sound. Queen at Arms is built on Ren'py, a Python-based engine, and is available for Mac, Windows, and Linux operating systems. Most modern desktop or laptop computers should be able to run the game without issue. Queen at Arms is not currently available for mobile devices or consoles. Thanks for downloading Queen at Arms! This game/demo is standalone and does not require the installation of any additional software. To access the game, please select the download appropriate to your operating system. Once the file has downloaded, open the .zip or .tar.bz2 archive and locate the demo launcher. The demo should begin immediately upon running. If you are experiencing any difficulties in accessing the game on your computer, or encounter any errors, please contact the Aqualuft team at queenatarms@gmail.com. 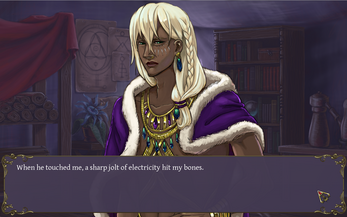 The currently uploaded demo is extracted from Queen At Arms: First Edition, and so some scenes and content may vary between the demo and the Deluxe Edition, which is currently the only version available for purchase.